Mobile Website VS Mobile App: Which One Is Better For Me? Business organizations have thought recently of adopting mobile device to fulfill their goals and satisfy their customers needs in addition to the desktop, as the number of mobile online users has been increasing. The mobile device offers two major sections for business owners: Mobile website and mobile app. Both of them are useful because they boost sales and maintain loyal customers, but each one has its distinctive features and purpose of use. 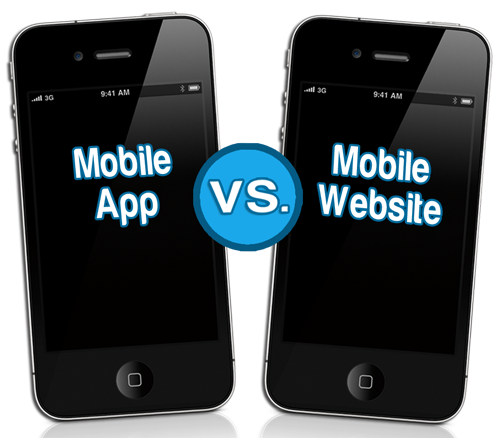 Therefore, it is critical for you to decide which one to consider for your business: Mobile website or mobile app? In order to decide which one is better for you, it is recommended to recognize the difference between each one. Mobile website is composed of browser based HTML pages that are connected together and accessed over the internet. Mobile website has the same characteristics that are available in the regular version of the website. It allows your users to see images, videos and contents like any other website. Your prospects can also be directed to proceed a specific call to action such as submit an application or make a phone call. Mobile browser requires either a wifi to function. Mobile app on the other hand consists of applications that are installed and downloaded through an app store or Google play rather than being accessed through a browser. Applications could be installed on smartphones and tablets without the necessity of the internet. Mobile app allows you to better have control over your website users presence and track their behaviors and preferences. Each one has its distinctive purpose of use. For example, if your intention is to create blog content to be seen by a large number of audience possible, a mobile website is better to use. However, if your ojective is to build a specific app like an interactive application, then mobile app is the best way to go. Sometimes, both of them are required to use for your business, therefore it depends on your organizations objectives.